Summary: Incredible scenes as an estimated one million people descend on the airport at Croydon to witness the return of pioneering pilot Amy Johnson from Australia. Description: In 1930, Amy Johnson became the first woman to fly solo from London to Australia, leaving from Croydon Airport in her Gypsy Moth. Upon her return, a crowd of around one million flocked to Croydon to catch a glimpse of this ‘aviatrix’. Here Johnson’s plane is seen flying over fields while crowds gather. 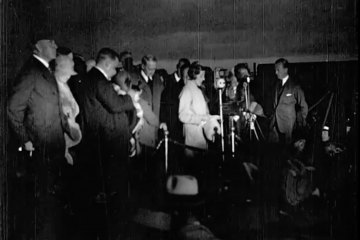 She then lands – the footage becomes rather grainy – and gives a speech to the watching crowd. Further information: Johnson’s plane is now in the Science Museum and Croydon Airport is a housing estate. The terminal building and the traffic control tower are still standing, and in the middle of the housing estate they’ve kept a stretch of tarmac which was one of the runways. There’s a Croydon Airport Visitor Centre at the site (http://www.croydonairport.org.uk/The-Airport). The hotel that is glimpsed in the footage is still open; now called the Hallmark Hotel London Croydon Aerodrome (http://www.hallmarkhotels.co.uk/hotels/croydon?gclid=EAIaIQobChMIlqnBkKen1QIVSbHtCh0-OQSDEAAYAyAAEgK9tPD_BwE).